Rooted in his passion for fresh, clean and imaginative cooking technique, the food at Fenix is a balanced blend of regional American food with classic technique and an eclectic edge. There is nothing like it in the region and it is sure to be a big hit with "foodies" and families alike. Ingredients will come, mainly from local sources. Produce from San Joaquin Valley, sustainable seafood from the waters of the Pacific and Pacific Northwest, wines from Lodi Appellation, and natural gras fed beef from Northern California. New, imaginative, modern, eclectic and, above all delicious. This restaurant has closed. They closed about four months ago. We made a reservation through open table for a large group and drove there. Disappointed to find out when we arrived that the business has closed. Restaurant is closed down. No notice. Nothing updated. The place was closed when we got there. The restaurant didn’t have the decency to contact the people who had reservations to inform us of that fact (we learned that they had been closed for about two weeks). Very disappointing. We always enjoy our dining experience at Fenix. The owner, Richard is actively being a chef as well as take time to say hi to the customers. The food is tasty and creatively presented. The prices of the wine is reasonable and affordable. Our meal was excellent. The crunchy Brussel sprouts appetizer was outstanding. Pair it with a salad and you've got a vegetarian dinner! My wife had the salmon over cauliflower risotto, and I had the scallops over pesto risotto. Halfway through the meal we traded plates, and the experience was exceptional. Fenix gets our highest recommendation for local fine dining! The food was not very good, the food was cold, the $36.00 steaks were tough. Always a wonderful experience dining here❤️ Food is always amazing, service is always friendly and quick. And the chef always makes a point to come around and see how everything is, he's amazing! Service and food were good. They sat us very quickly and we had a nice time. If it was a bit less expensive we would eat there more. Try the bread and the Brussels Sprouts. It can get a bit noisy when crowded but otherwise has nice atmosphere. Richard Hyman's seasonal menu and creative approach make this dinner spot worth the drive to Lodi- I challenge you to find a better restaurant in the Valley! I went with a group of ladies to Fenix for Sunday brunch. This was the first visit to Fenix for all of us. We had a fantastic time! We were served fresh baked goods as soon as we sat down, and the servers kept the mimosas coming. If you're not planning on drinking, the dishes are pricey, but if you do take advantage of the bottomless mimosas and baked goods, it's a great deal! There weren't many vegetarian options on the menu, but the restaurant was very good about making meat options vegetarian; I had the Fenix benny, and they substituted the ham with tomato, zucchini and green beans. It was delicious, and they eggs were cooked perfectly! The atmosphere was a bit loud, but after a mimosa or two, you didn't notice. It had a good energy about it. I also appreciate it that they used local ingredients, and I hope they start using more and more organic ingredients. I'd definitely recommend this place for a Sunday brunch! Update website, menus didn’t match. When some people choose a restaurant, they have an entree in mind. And when it isn’t available, it’s a downer. The waitress was top notch , but the girl helping never came around to fill the glasses up with water or see if we needed anything. The halibut was bland and the scallops/risotto was so salty is was barely edible. I think the seasoning for both dishes somehow ended up on the scallops. Very, very salty, unreasonable so. Do not miss the linguini! It was the best my girlfriend and I have ever had !! The swordfish was equally delicious, and the wine selection define! Would highly recommend this place, especially for anyone visiting the area for the first time. After reading several bad reviews some years ago when Fenix first opened we decided to wait to try it. So my wife finally convinced me that maybe it was time. No, nothing had improved. The service was so-so. The food was uninspiring to say the least. We shared the Roasted Brussel Sprouts for an appetizer they were burned. My wife had the Flank Steak. Meat tough and sauce salty. I had the pasta dish with prawns. Lots of pasta very few and little prawns. Then a large group of 30somethings arrived and the place turned to bedlam. Sorry, will not be going back. Don't miss the Blackberry Jalapeno margarita. Lamb chops were delicious. The food was excellent and there were sufficient choices for vegetarians. The cocktails were very good and reasonably priced. The overall cost of the entire meals plus cocktails was very reasonable and the quality was excellent. The service was very good and attentive. And, we were able to meet the chef-owner and had pleasant conversation with him. It was a great experience and we will definitely return again. Fe Nix’s chef Richard is amazing. We were a party of six and tried many different plates. Each dinner was superb! The lamb was the best ever. Pan roasted scallops were perfectly prepared and juicy on a bed of Pesto risotto - great flavor combo. Alaskan halibut paired with ranch beans was a delightful experience. This restaurant is a must for any foodie looking forward to a great dining experience after a day of wine tasting and exploring in Lodi. My sister and I enjoyed an amazing meal at Fenix last Saturday night and I mean AMAZING! We had the Brussel Sprouts appetizer which was so flavorful and crispy. The featured salad was mouth watering with fresh berries and watermelon. The fish was perfection as well. It was my birthday so they sent over a complimentary chocolate gelato that was as good as it is in Italy. The chef is extremely friendly and took very good care of us especially with my sisters celiac disease. Can't wait to go again! Brought the entree before finishing the soup. We appreciated the unexpected birthday ice cream but were shocked that they charged for it without ever asking if we wanted it!! My mom, sister and I went to The Fenix for dinner during our girls trip to Lodi. The food was AMAZING and you could taste the freshness in every bite. We were a huge fan of the tapas style dining so we could enjoy a little bit of everything during our dining experience. There were plenty of vegetarian options for us to choose from and enjoy. One of my favorite items was the Brussel Sprout dish the flavor combinations were on point. They also had very unique and delicious cocktails that we each enjoyed. Overall it was a lovely and very satisfying experience for all of us! What a GREAT place! loved the decor and the service was very good. The food was great too! Much different than I'm used to, but very good! will definately come back! We were celebrating my best friends engagement, and the server made it very special celebration. The food was amazing, highly recommend this place! The entrées were all delicious, appetizers needed some work Brussel sprouts were burnt pretty bad. Drinks were delicious and wait staff was good. Restaurant had off putting smell when we walked in the door and appeared pretty clean . Best petite filet mignon ever!!! Service was excellent! Wonderful place to eat. Very clean and conveniently next to the Lodi theater downtown. The service was great. Staff was very friendly and accommodating. We were there for brunch and the food was superb. I highly recommend this restaurant as an excellent place to enjoy a good meal. Great service and food was good . Only draw back was we were seated at a high table against the kitchen . We asked to move another table but it was reserved for another party of 8 who ended sitting elsewhere when they got there . From the hamburgers to the steaks, everything was great tasting. The only thing I would say is that the dishes could have come out more "stove hot". Will definitely go back. Heard a lot about this place, but I am not sure what all the talk is about. I live about 45 min away and I don't think it is a place I want to drive that far for. Food wasn't bad but it didn't scream "I have to come back tomorrow" great service, met the chef he was nice. I was looking for a wow moment and never got there. Chef came and congratulated our graduates and we complimented him on our outstanding meal! Will return again and again and again. Everything was exceptional. Had casual dinner with friends on a Friday evening, place was hopping. Food and service were excellent! 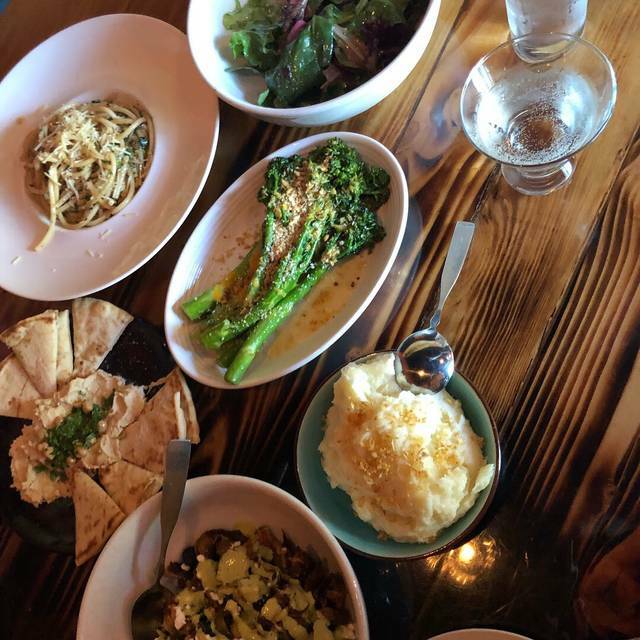 Small plates offerings were just right for a light meal before an evening of Dancing. Hamburger was super good, reasonably priced for dinner. Scallops were good but could of had one more for filling. Delicious all around! Love this place. Great food and love the ambiance and theme.